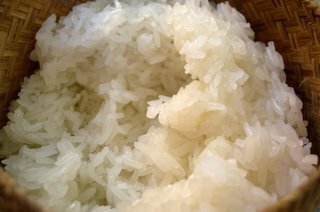 Thai people in the northern and northeastern regions eat sticky rice (also known as Kow Neuw) in place of long grain rice. This menu is vegetarian foods, non-fat and easy to cooking. You can use Kin-Jay festival. 2. Bowl a pan of water in a saucepan that can be fitted with a steamer. 3. Line a bamboo steamer with a tea towel, and put soaked rice on top. 4. Steam rice for about 30 minutes, or until grains are no longer hard and the rice is springy. It is eaten with your hands by making a little ball and dipping it into other dishes.